This part is simple. 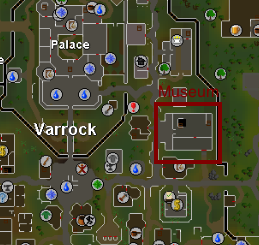 All you have to do is go to the Varrock museum basement and answer all the questions at the exhibits. This takes only a few minutes and also gets you to level 9 slayer along the way, and who doesn't love slayer? Once this step is completed, you're already on you're way to becoming a hunter master. 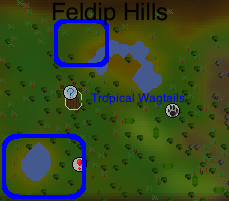 For those of you that refuse to benefit the great cause of the Varrock Museum, head on over to Feldip Hills with some bird snares. You'll be hunting crimson swifts from levels 1-5. They can be found southeast of the fairy rings there, right near the pond. Once you hit level 5, grab your desert robes and waterskins to go hunt some golden warblars. These birds can be found directly west of the Ruins of Uzer, so just take a carpet ride there and walk west. Catch some birds and get to level 9. This next part was probably my least favorite. 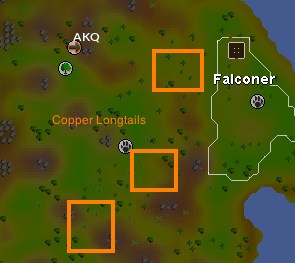 You'll be hunting copper longtails in Woodland hunting area just North of Eagles' Peak. If you have fairy ring access, use the code AKQ to get there fastest. If not, you'll just have to make a long walk over there (just enjoy the scenery). Make sure you have your bird traps and be patient, hunting can be very slow at these low levels. Now head all the way back to Feldip Hills and start hunting some tropical swagtails (yes I meant to call them that). Once you hit level 20 you somehow gain some hunting knowledge and learn the secret art to lay down not one, but two traps at once! This will actually start speeding up your hunter training quite a bit, just keep up with it. Tired of hunting birds? I thought so. So lets move onto the next best thing: salamanders! Make your way to Canifis with a couple small nets and ropes. 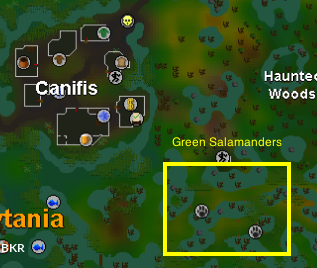 The green salamander hunting spots are found just southeast of canafis. Once you're there, simply click on the trees around to set up your trap. Release all your salamanders and keep on hunting. Make sure you pick up all your nets and ropes when the trap fails too. I would also encourage bringing some cheap food just incase some ghast tries to attack you. NOTE: Priest in Peril quest is required for this method. Once you hit level 40, you can now use 3 traps. This is probably the last annoying phase of hunter in my opinion. You'll be hunting orange salamanders out in the desert. Make sure you have your desert robes on and plenty of waterskins. Bring as many ropes and nets as you feel necessary. You can also bring a knife if you want so you can fill up your waterskins, or you can just simply bank. 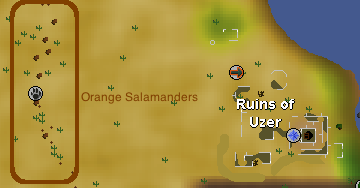 The orange salamanders are in the exact same location as the golden warblers (west of the Ruins of Uzer). Just hunt like you did at green salamanders, it's the same concept. This part will be a little tedious because you might have to make a few bank trips to restock on waterskins, but just hang in there, it only gets better. Finally, you're on your last set of salamanders. I know, all of those ropes and nets are getting old. You'll be hunting red salamanders for this part. They can be found at the hunter zones near the Zamorak altar just north of the Observatory. This is the same process as the salamanders before. You're xp/hr will start to greatly increase during these levels and hunter will soon become a quick skill to train. Once you hit level 60, you can now use 4 traps. Now you have two options once you hit 63. 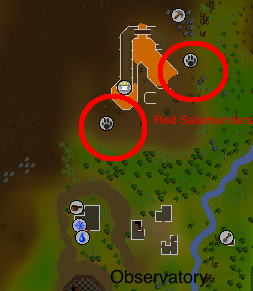 You can either start hunting red chinchompas and be on you're way to make bank, but suffer a slight initial xp/hr loss, or you can stay at red salamanders until 80. At level 80 you can now use 5 traps, which makes red chinchompas super fast. I preferred hunting chins right at 63 just because they were more fun to me, but it's up to you. That's right! Now you're finally on your last step to becoming a master hunter. It's just a very long and repetitive step that many people find awfully boring. 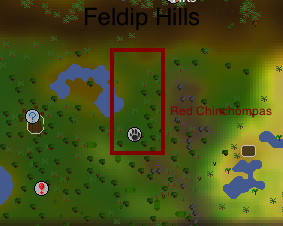 Head on over to Feldip hills with a bunch of box traps and start hunting red chinchompas. My preferred hunting spot was slightly southwest of the fairy rings (close to the hunter icon and a pond on the map). You'll be able to tell where by all of the people/bots there. Just keep hopping worlds until you can find your own. I actually preferred to hunt with one other person just to have someone to talk to, but some people like a world to themselves too. Just hunt here until your little heart can't hunt no more. 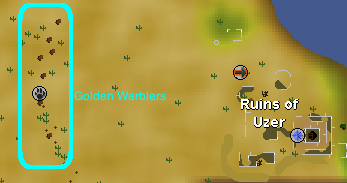 NOTE: There is a private hunting area for red chinchompas if you have completed the Hard Western Provinces Diary. 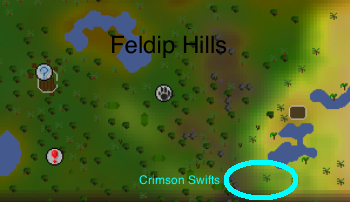 It is located just south of the hunting expert in Feldip Hills. I hope the guide is helpful! very very Nice guide! Would be cool if you added some pictures or something to make it attractive but it definitely gets the point across, in a great way too! Just wanted to throw in there, that if you don't feel like doing the salamanders, Falconry is always a viable option. You can start Falconry @ Level 43 Hunter and it costs a fee of 500gp to begin training this way. No mention of black chins/private red chin area? Black chins are pretty dangerous too, unlike other chins they don't "run" on death. Getting to 99 with them would be frustrating, and unlike red chins where you can pay little attention, you'd need to keep an eye on the map for blacks. In short, black chins are normally not recommended. OT: This guide is pretty good, I agree some pictures would make it a lot more visually pleasing (also people are lazy so pictures > words). Nicely done.. few imgs too spice up the thread and its a beaut. Great guide, I'll have to look into this as a combat 102 w/ 1 hunter (shame). Will use for sure! Nice guide for one of my favorite skills in the game. Black Chins are also an option but if you'd rather not deal with PKers stick to Red Chins. They'll still bring ya a decent cash stack.